Business Education in the U.S. If you are looking for the top-rated business schools in the world, look no further than the U.S. Inventor of the MBA, the U.S.'s focus on higher education and innovative business leaders drives MBA programs with lucrative return on investment for candidates. Browse programs and request information to find out details and reach out to admissions. Read more about business programs in the U.S.
Business schools in the U.S. are drawing a rising number of applicants and students. Playing host to many of the world's highest ranked business programs in addition to providing a better professional landscape to candidates in the U.S. and abroad, business education in the U.S. is thriving. How to get more in-depth information about business programs in the U.S.
You've seen the statistics, read about the programs, and considered your qualifications and program benefits. What's the next step? If you're struggling to narrow down your applications, you should consider moving off the page to establishing contact with people. Some key individuals to consult will be admissions officers who can give you a detailed breakdown of who your class will be made up of, key benefits, and an analysis of how the school can meet your professional needs. Emailing, calling, or visiting faculty at the university will give you insight into your curriculum and learning experiences. An often overlooked avenue is to get into contact with alumni - specifically those who are in a professional position that interests you. Contact them through university admissions, LinkedIn, or their professional website and, if they are helpful, they can provide you with insight into the benefits and shortfalls of the program in helping them into their career today. Postgraduate business education takes a temporary toll on your finances and time so learning as much as possible about the program is crucial. Research by Bloomberg Business has shown that some of the most highly ranked MBA programs do not give a return on investment in the first year after graduation than some programs who deliver skilled graduates who have not paid the brand-name price-tag. Still, Ivy League universities dominate in surveys asking employers which MBA graduates are the most desirable job candidates. Ultimately, the admissions choice is yours. 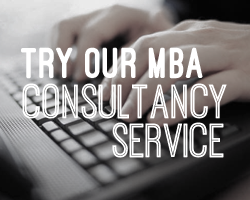 In the U.S., it is common to specialize your MBA. In the first year candidates often receive a foundation in business practices with the second year dedicated to developing special skills in an area of interest. Some common concentrations are International Management, Marketing, and Finance. Postgraduate education programmes are offered in all fields of education and are typically obtained after earning a similar bachelor’s degree. In the business field, these programs are usually referred to as executive education programs, however, they can be available in the form of specialized master’s as well. An MBA is usually tailored to students with 2-5 years of professional experience while an Executive MBA is suitable for people with significant managerial experience looking for an entry-point into a higher leadership position within their company or a move to a larger global organization.